Melaka is an amazing tourist destination that holds some of the nation’s greatest historical landmarks and adventures. The cultural heritage of the state is a spectacular one and is a must visit if you are in Malaysia. If you are in the peninsular, complete your tour by heading down to Melaka and begin your adventure of the cultural sites that Melaka has to offer you. It is a well-known fact that the Baba and Nyonya community have been rooted in the British Straits Settlements of Malacca. This unique community is the result of inter-marriage between the Chinese and the Malay community. Baba and Nyonya Heritage Museum is the best place to explore the unique culture of the Baba and Nyonya community. This museum is a museum like no other. Located along Jalan Tun Tan Cheng Lock, the museum is in close vicinity to the famous Jonker Street. The building is a century old but still remains well-kept without altering the natural and unique charm of the home. When you step into the museum, you cannot help but feel like you have stepped into the home of Baba Chan. The furniture and interior design has featured a unique blend where east meets west. Some of the furniture here are antiques and most of the layout has been left untouched from its original position. Baba and Nyonya Heritage Museum is a living museum that illustrates the culture and lifestyle of the Baba and Nyonya community. The front portion of the museum will lead you to a beautiful courtyard that allows just the right amount of sunshine to stream through the house. If you close your eyes, you can imagine the old couple as they sit and sip their cups of Milo in the monsoon season as the rain patters down through the opening of the courtyard. The museum also features Chinese works of art that has been passed on from generation to generation. Another highlight of visiting the museum is the display of some of the costumes that the community wear during special occasions. 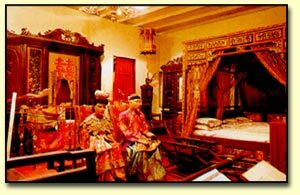 Visitors also get to see the bridal chamber that would be a luxury for a young peranakan bride. Photographs of the family and the activities carried out in the close knit community line the walls of the hallway and you cannot help but feel like a special guest as you walk down the beautiful memories that the Chan family has preserved through the generations.